Sometimes we shoot ourselves in both feet but don't feel the pain until most of the way through the race. And so it has been with the current pair of socks, just off the needles today. They look innocent, don't they, laid on a picnic table bench for display? 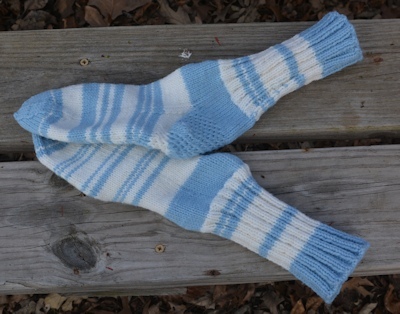 Just a simple pair of light-blue and white striped socks, simple construction, nothing to 'em. But behind these socks are a series of assumptions about what the yarn would do, and I could do, given the circumstances involved in making the socks--which I set up for myself. I made these socks for a friend who lives over a thousand miles away. Which means I have never had her feet to measure, or measure with. At least when I made socks for my friend who lives part of the year in New Zealand, she was only fifty miles away and we saw each other at choir practice and on Sundays. So, right off the bat, I depended on my distant friend to understand my request for certain measurements. 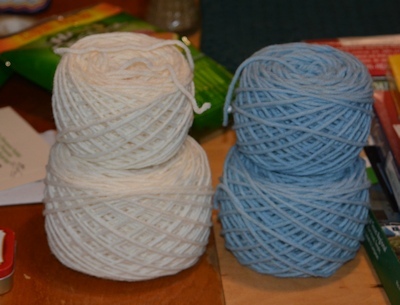 I had a full or mostly full skein of the white, and a partial skein of the blue. Hence, not enough of either to make a pair ot socks. Hence, stripes. I felt very clever at that point. It "felt" like altogether there was enough weight of yarn for two socks. No, I don't have a scale that would have weighed to the right accuracy to find out, or even find out how much blue there was. It "felt" like maybe 2/3 of the amount in the white skein. Surely at least half. I started one sock, then realized it would be better to work them in parallel. So...without measuring (too much yarn to measure it with one little ol' yardstick and the weather was cold and wet--no stretching it on the lawn outside), or getting a scale so I could weigh it, I decided to "guesstimate" while winding it from the swift what was half a skein and half the unknown amount of blue. Yeah. THAT was smart. Not. 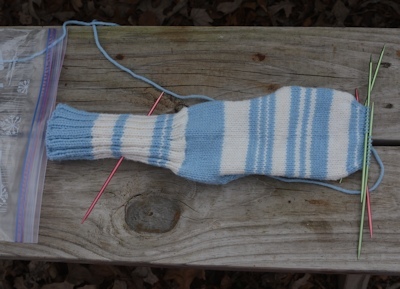 I had in mind a design with bold, matching stripes on the cuffs, with the blue used below the ribbing and for the heel, with thinner non-matching blue stripes on white for the foot, and a blue toe with a single white stripe...for the sock that used the smaller ball of blue...there sure wasn't much blue left when I finished. At least I'd made my friend a pair of socks with the same kind of yarn before (socks my mother had started.) And I had measured the socks, making notes. With sketches. With numbers. Notes I had been sure were complete. Except they really weren't, something that became clearer and clearer as I neared the toe decreases. Where I wanted to reinforce the carrying of a color across another stripe to another of its own, by knitting one stitch with both yarns, the stiffness of the yarn pushed other stitches much farther away than normal, and there's a laddery vertical row in the back. Not a problem I've had in striping the ribbed cuffs with wool yarn. I consider the successful (if these fit my friend, which I won't know until she gets the package and tries them on) completion of this project to be way more luck and stubbornness than intelligence and skill. Just so you know. Yes--when we're young, self-discipline is too often presented as something other people have and we don't...it's an either/or thing, and if someone's trying to convince you that you don't have it, they usually don't do it in a way that lets you understand it can be an incremental effort. It's "Jill NEVER lets HER room get messy; she ALWAYS keeps her things neat. You're a messy slob" or "Jack NEVER gobbles at the table and eats too much candy and ice cream; HE never has to buy chubby jeans. You're just a pig, you never stop stuffing your fact." And of course "Jack/Jill ALWAYS does his/her homework RIGHT AWAY..."
So we don't, as kids, understand that nobody's really that perfect, that the intersection of their experience and their innate mindset gave them more of whatever than yours did you, and we think a) we're really that rotten and b) there's no way in hell's half-acre that we could achieve self-discipline. Yet, bit by bit, we can, even without outside encouragement. One cannot overemphasize the value of determination/stubbornness. It sure seems to get us through more of our mistakes than luck does! I'm glad you learned so much, glad you persisted (they look nice), and very glad you're sharing the relative importance of a lot of what you learned. I'm going to be trying to learn to crochet socks this summer, and there's a lot of learning between now and then for me to do! Stubbornness does indeed work in a lot of situations (not all--not the times when it really is better to quit digging that hole you're in and climb out before the sides fall in and bury you.) There's usually a point in every book when quitting looks good because it's gotten itself in a tangle...but the only way out is through, one word, one sentence, one paragraph at a time. Crochet is not my metier...my mother taught me that, as she taught me simple knitting, but I never progressed beyond granny squares, and now I have trouble with the whole concept. So I admire anyone approaching socks with a crochet hook and a ball of yarn. I wish you well. A few things I learned by starting to knit socks at 67: 1) It's easiest to knit socks for yourself, because your foot is always there for you to use as a measure. 2) Use yarn that feels good to your hand, and in a color you like. It's much easier to keep going when the yarn cheers you up. 3) Start with a minimal ambition: that you'll consider your first socks a success if they go over your feet and your feet like the feel. The refinements, after the first pair, come pretty easily, but perfection on the first pair is unlikely (at least in knitting.) 4) A little too big feels better than a little too small. Most of us have never, as adults, had socks that really fit, because of the elastic. 5) Ignore anything I said that makes no sense to you or makes you say internally "That's not how I want MY socks." Your socks, your rules. I would suggest trying to make a pair of slippers first. Same sort of heel design as in socks and you work from the toes up. Then you can try an actual sock pattern and work from the cuff down. That's how I finally figured out how to crochet socks. But you might find it easier to make socks before slippers. Have fun whichever way you choose. The finished socks look good and chances are the back will be hidden under pants so no one will see the laddering. My congratulations for finishing with yarn that was so hard to work with. The last time I tried working with yarn that split and tangled into knots on me I gave up the yarn and did the project with different yarn. I can be very patient but that yarn pushed me past my limit. Lol. This yarn has now pushed me past ever wanting to knit with it again. I sent the leftover yarn (maybe enough to crochet a few potholders or mend a torn sock) off with the socks. If I find more of it buried in my mother's stash, I'll give it away. And I think I must buy a very accurate scale, so I can weigh yarn that's in partial balls/skeins, and see if there's a gadget that you can pull yarn through to find out how many yards/meters of it you have. I've found some partial balls and skeins in my mother's stash already that's good 100% wool and I'd like to use--but I can't plan what to use it on until I know how much there is. and see if there's a gadget that you can pull yarn through to find out how many yards/meters of it you have. Such a gadget exists, and I think costs $15 or so at Michaels. It's not terribly accurate, but certainly good enough for your purposes. There are much fancier (and more expensive) versions for people who need accurate skeins (say, after dyeing). I'm just learning to knit and I'm having fun with it. So far I like big wooden needles and super bulky colorful yarn. I hope one day to be able to knit socks. I have large ankles and calves and all mass-produced socks squeeze my ankles. Never thought I'd say that I like knitting, but I find it very meditative. I like the feel of the fiber in my hands. I do like your posts on socks! Inspiration! When you want to start on socks (you don't have to wait NEARLY as long as I did!) here's some advice--much of it given to me by various people in little snippets, some my own. 1) Materials: Start with worsted-weight yarn, which makes sturdy socks on size 4 or 5 US needles (and thus you can see the stitches easily, fix mistakes easily, etc. Pick a color that makes you really happy to work with it, and not too cushy a "hand"--it needs to feel good in your hand, but a fluffy or extra-soft yarn won't wear as well under your feet. You can knit socks with a cable needle (using the magic loop technique) or with double-pointed needles. I learned to knit in the round with DPNs from my mother, so I use them. If you do use DPNs, learn to use sets of 5. It really does help prevent laddering between needles, which can be a problem with the ribbing on cuffs. If you want "bulky" socks, they may not fit in shoes well, but would make really fun house socks/slippers. 2. Sock Psych 101: Always have both socks of a pair going at the same time. This prevents one-sock syndrome where you knit one sock and then lose the determination to knit another. Cast on both socks on the same day (if you have to stay up another 15 minutes at midnight to cast on the second sock...) Turn both heels on the same day, preferably one right after the other (reinforces the skill of turning a heel to do another one right away--second one's easier), start toe decreases on the same day, and finish the socks on the same day (and put them on your feet right then--it's time to celebrate. They don't feel as good 'raw' as they will after washing, but you can gaze at your tootsies and be proud for a half hour, then take them off. Or not.) If you go on with sock-knitting, I find it helps to start a "following" pair when about halfway through the "front" pair. Do a row or two every day on the following pair--no more--and they'll have a good start by the time you've finished the front pair. I find that motivating. You may find it crazy. 3. Sock Psych 201: Socks exist to make your feet happy. A sock success is a sock that will go on your feet without a struggle, that feels good. Feeling good is the most important criterion for a sock. Your first sock may have knitting mistakes (mine was full of them), be a little too big (I could walk right out of mine) BUT it felt so much better than the socks I'd been buying. It was easy to refine the fit with the next pair, and the next. Now my socks feel even better. Mostly socks are inside footwear and not all that visible. Thus: your socks can be successful from the first pair. To have success with the first pair, pick a simple basic pattern: ribbed cuff, plain knit sock, a simple heel. The fancy stuff can wait until you've got your own sock pattern that fits your particular toes, foot, heel-and-instep, ankle, and calf. You don't have to be a great knitter (I'm not) to make comfortable, wearable socks. 4. Techniques. Long-tail cast-on. There are good videos on YouTube if you don't know that one. It's perfect for socks because it's stretchy, particularly important if you have large calves. I use a needle at least 2 sizes larger than the one I use for the sock fabric (thus, usually a size 7, while knitting sock with size 4 or 5. Knitting in the round, including knitting 2x2 ribbing in the round. For stitches: knit, purl, slip a stitch, knit-2-together, purl-2-together, and a decrease that leans the opposite way from K2tog; there are several. (I can never remember which way they're said to lean, but they have to lean the opposite way, whatever you use, so the gussets point toward the toe and the paired decreases make a neat pattern on the toe shaping.) a left-leaning and a right-leaning decrease. I use knit-slip- knit, pull slipped stitch over the second knit stitch. Simple and fast. The one called SSK defeats my tiny brain. It's helpful to have a simple increase in case you want to work around an extra wide place in your foot (a bunion, for instance) or find you have decreased a bit too much and want to add it back. 5) Patterns. There are bazillions of sock patterns, some absolutely gorgeous, but published patterns are made for average feet of a given range of shoe sizes. The assumption is that the circumference of the leg, ankle, and foot will relate in an average way to the length of the foot. (And your feet probably don't. Mine don't. The feet of the people for whom I've made socks don't.) Socks made to average measure will fit better than the "one size fits all" or "small/medium/large" commercial socks but not nearly as well as socks made for particular feet. We have to buy shoes designed for average feet (or what the shoe manufacturer fondly believes are average feet!!) but making your own socks means you can fit your feet *exactly*. Your feet will love you for it. This is why starting with a very simple pattern is a good idea--you're not having to recalculate for cables, or pattern repeats in colorwork, or anything but your own knitting gauge with that yarn and the feet that will be inside the sock. For instance: standard patterns assume the same diameter/circumference of the leg, ankle, and foot beyond the heel/instep. Not my leg/ankle/foot. My regular socks are 60 stitches on size 7 needles at cast-on, 60 on size five for the 5 inch ribbed cuff, 56 for the inch and a half before the heel flap starts, a 2 or 2.5 inch long heel flap (depends on the exact yarn and whether it's a crew sock or a shorty), which means the distance from point of heel up over the top of my foot runs 78-80 stitches, with a steep gusset decrease (decrease 2 successive rows, then non-decrease row, rather than alternate rows, to give ease to a high instep and then snug back in for the high arch) to 52 stitches, two non-decrease rows and another decrease to 54 for the balance of the foot. I fit each sock to my own toe slant (I have very pointy feet), which means it's different for each foot (not only direction but exact shape) and that means no extra bulk in shoes, plus ample room for the longer toes and no side-to-side compression. As you can tell, I've become a happy enabler of people who want to knit socks. I'm not an expert, but the fact that I am now a happy and confident (if far from perfect or expert) sock knitter gives me more connection to those who are teetering on the brink of sock-knitting. Or I like to think so. And now that I've run past LJ's character-limit for comments twice...I'll quit. Thank you so much for the tips and psych 101! Very valuable to a beginner! Glad to help. Knit on! And she likes them a lot! She's coming for a visit, so I will have access to her feet, and can refine her pattern right here, and both give her her own pattern (hint! "If you learn to knit your own, you'll have more socks than if you wait for me to knit them...") and make her even better socks, though not more than a couple of pairs a year because...well...I'm selfish and I want to keep up with my own wearing out and build up a backlog for future loss of vision and stuff like that.